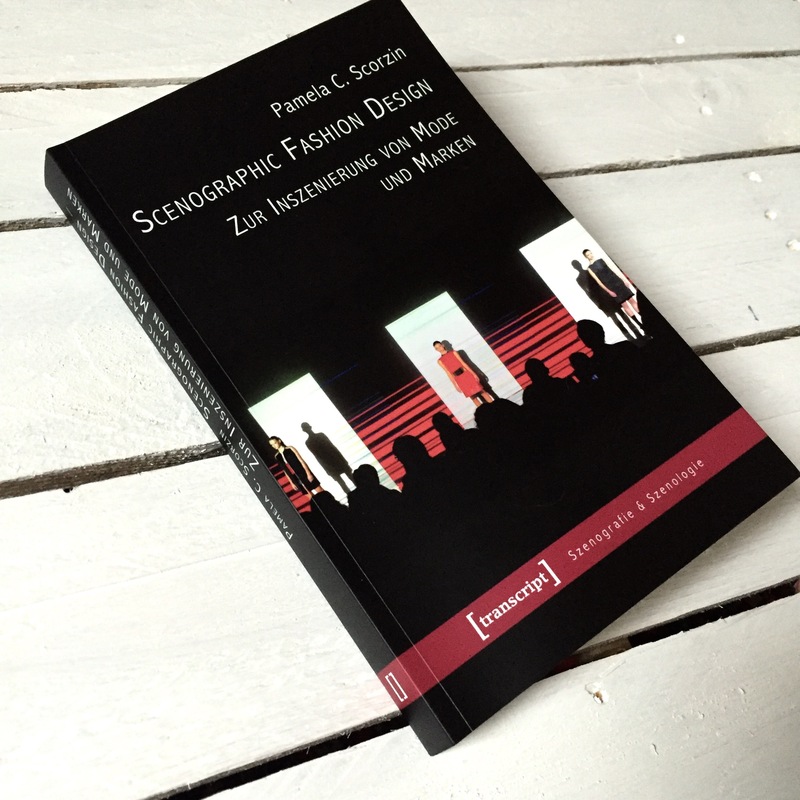 Today’s #artbookfriday post is about the book Scenographic Fashion Design which is only available in German so far, what is a shame. It’s a scientific essay collection by Pamela C. Scorzin about the phenomenon of staging fashion. Fashion shows, films, exhibitions and stores are designed to build a certain brand image today and changed tremendously in the last decades. The author, Pamela C. Scorzin, is a professor for art and visual culture in Dortmund. Her writing style is still easy to understand and not at all bigheaded like the style of many other professors who publish regularly. I liked reading it. Just ignore the foreword by the editors. The book is divided into six main chapters, starting with some remarks about scenographic branding and fashion design. It’s a very great entry to the topic if you never thought about it. It’s a lot about the relation of brands to scenography and artists. Also on how the borders between the different genres (fashion design, art, architecture, scenography, theatre) get more blurry and even non—existent when it comes to the presentation of fashion. For Scorzin the whole process makes fashion more democratic and she also uses bloggers as an example for the change in the industry. I can see her point and it’s often said but I just can’t agree with it. Things changed, that’s true, but there’s still a gigantic industry made by a few people who decide what’s in fashion today. Of course bloggers and some designers changed the old ways, but it’s still a business and not a nice little kindergarten. It’s a lot about entertainment and attention. Some fashion shows don’t seem to be about clothes at all anymore. Except of her very positive attitude towards the industry I agree on the fact that art and fashion design are more related to each other today than ever before. Designers don’t just collaborate with artists any more, they also get museum exhibitions and cross the border to art themselves. But as scenographic fashion is also about designers working with artists you can learn a lot about those examples, too. Fashion icon Iris van Herpen and Belgian artist Lawrence Malstaf created an installation in which models were held in midair between sheets of plastic while the catwalk was around of them. There’s not just an impressive video of the show but also a photo art series by Malstaf. Furthermore the collection included 3D-printed garments created in collaboration with Austrian architect Julia Koerner, who also helped design a dress for Van Herpen’s Voltage collection. Iris van Herpen is one of my favorite designers and one of the best examples why fashion is a form of art. No wonder she is in the book. Kostas Murkudis is of course also mentioned in there. He is the morst radical as he stopped creating wearable clothes and above all stopped selling his clothes entirely. But he is one of the examples in the book because he made a fashion show with artist Carsten Nicolai which was staged at the MMK Museum in Frankfurt during the exhibition Not in Fashion 2010. Murkudis also did a great collection as homage to the German artist Franz Erhard Walther which belongs to the MMK collection today. I have to say I haven’t been this fascinated by a scientific book for years. There is so much to discover and learn in there, I probably will read a few more times. It’s just so much information. The author definitely did an amazing amount of research work. There are also plenty of images which help to google and find the collections she writes about. Especially when you don’t remember them or aren’t a fashion show and exhibition geek like me. I really could have used this book when I had my courses about art and fashion at university years ago. But well, never mind, now it’s a great source for everyone who wants to know more about the way fashion is staged and brand images are made and who is behind it. you can get your copy here.